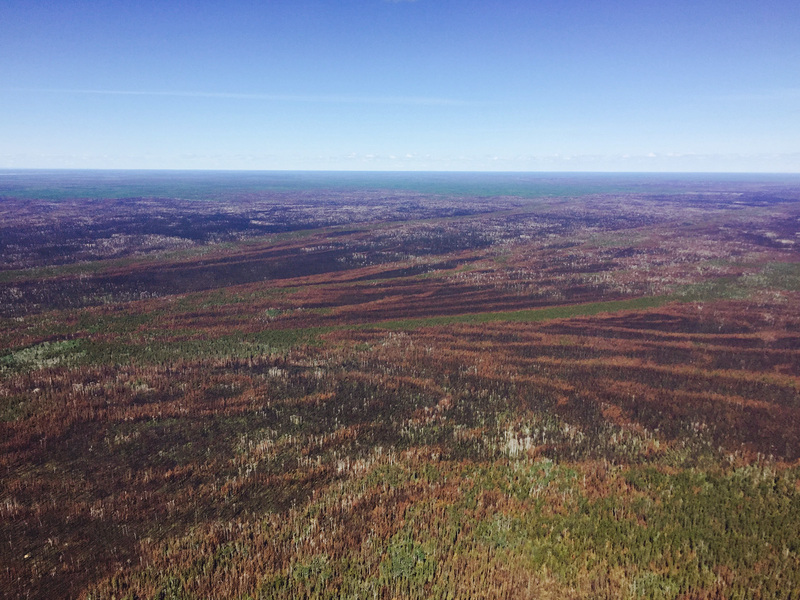 Patterns of wildfire damage in Alberta's boreal forest (credit: Natural Resources Canada). A new predictive model using ABMI data suggests that Alberta’s boreal mixedwood forest could decline by at least 50% in the next 100 years due to climate change and wildfire. Change is a funny thing. Sometimes it’s blatantly obvious. Other times, like the old fable of the frog and the boiling water, you only see it in retrospect. Climate change poses various risks to life on Earth, and one is that it will change patterns of vegetation across the globe. A new study by the U of A’s Diana Stralberg, with data (and collaborators!) from the ABMI, is shedding light on what that might look like in Alberta. As it turns out, the short answer is “very different”—Stralberg found that at least half of Alberta’s boreal upland forest is at risk of disappearing over the next century. You’ve probably heard about species moving northward as the climate warms. Part of this is the increase in temperature—if northern climates aren’t as cold, southern species can survive where they previously couldn’t. But that’s only half the story. As the climate changes, most established species don’t just disappear to make room for invaders from the south, so on-the-ground species patterns lag behind what the new climate could support. For example, for wholesale vegetation change to take place, you need another, faster-acting agent of change, which in Alberta is usually fire. Fire can wipe the landscape clear, overcoming established species and allowing more southerly vegetation communities to claim their place. Wildfires and other intense disturbances can ‘reset’ vegetation on the landscape, allowing new species to move in. Fire frequency and severity is expected to change, and most likely increase, as Alberta’s climate changes (credit: Natural Resources Canada). Based on temperature and precipitation change alone, around 98% of the boreal mixedwood forest could be converted. This is called the ‘climatic potential’. But it’s unlikely that this will happen—recall that wildfire is needed to really allow vegetation change to proceed. Sure enough, Stralberg’s results hinged on assumptions about the frequency and severity of fire, which is also affected by climate. Using conservative numbers for wildfire, “By 2100, at least 50 percent of the boreal upland mixedwood forest could become young deciduous forest and grassland, based on a combination of changes in climate and wildfire,” says Stralberg. With more extreme assumptions about wildfire, more than 75% of Alberta’s boreal mixedwood forests could be converted. Either way, Stralberg’s model doesn’t take into account the effects of direct human activity (e.g., deforestation), drought, insects, or other factors that might accelerate the process of vegetation change. One way or another, it’s likely Alberta will look very different 100 years from now. 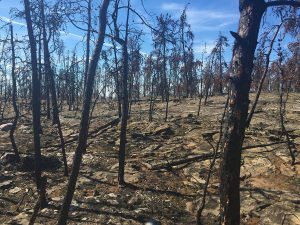 “Although fire is a natural component of [the boreal mixedwood] ecosystem, the irreversible loss of old forest could have detrimental effects on many species, including many resident and migratory songbirds,” notes Stralberg. Models exist to make predictions about the future, and it’s those predictions—“Alberta’s boreal could shrink by 50%”—that tend to make the headlines. But what’s arguably more important is the insight they can give about the present, the trajectory of change into the future, and what can still be done to alter it. “Our model assumes ‘business as usual’ in the province, with high carbon emissions and climate change continuing at the current rate”, says Stralberg. “So societal action can still reduce this risk”. From the ABMI’s perspective, it’s about ensuring Alberta’s decision-makers have the best information—the best tools—available to support informed, evidence-based decisions for Alberta’s future. To anticipate and adapt to climate change, land managers need to understand how landscapes are likely to change. Predictive models like this one can help with that, and ensure that foresight, not hindsight, is as close to 20-20 as possible. We’re pleased to have been able to support Stralberg and her team in their work. This research was a collaboration between researchers from the U of A, ABMI, and Natural Resources Canada. Diana Stralberg is currently working as a research associate in the Faculty of Agricultural, Life and Environmental Sciences, continuing her research. 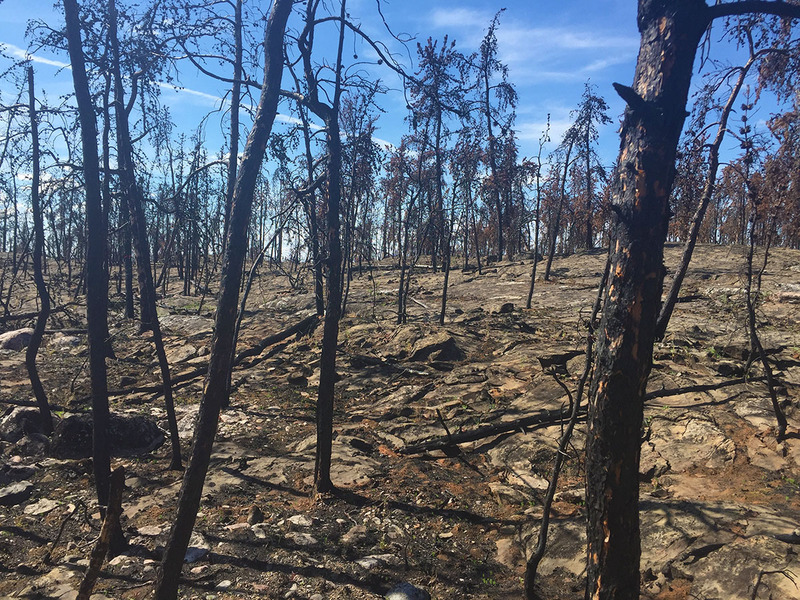 The study, “Wildfire-mediated vegetation change in boreal forests of Alberta, Canada,” was published in Ecosphere and covered by CBC, CTV, and other media outlets.